What happens when two kids decide to dig up a dinosaur in their backyard? They begin an excavation that will take them through 125 million years of Utah. Each page uncovers a new payer of Utah History. 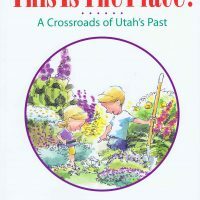 This Is The Place combines equal parts illustration, information, illumination and fascination in a delightful and enlightening read for children, teens and adults by Salt Lake Tribune Editorial Cartoonist, Pat Bagley. This book is also used in classrooms across the state of Utah. Pat Bagley is the editorial cartoonist for the Salt Lake Tribune and the award-winning author and illustrator of several Utah and LDS books, including I Spy A Nephite, and Welcome to Utah. Will Bagley is a native of Salt Lake City, Utah. He attended BYU and graduated from the University of California at Santa Cruz in 1971 with a degree in history. He was awarded the Evans Manuscript Prize by Utah State University for his Frontiersman: Abner Blackburn’s. Cool book. Get a glimpse at historical Utah as two kids dig up things in their yard. Reminds me of when me and my friends would try to dig passages to China.